Savory salads are important to any meal in our rig. Generally, for a big Sunday dinner or a special holiday meal, I like to include a green salad in some form in addition to a fruit or other variation salad. This way, most of my hungry hooligans will eat one or the other. Caesar salads are a favorite among my crew and we make it a few times a week. I simply hop a few heads of organic romaine lettuce, sprinkle Parmesan shavings over the top, add Caesar croutons, and mix with Marzetti’s Supreme Caesar dressing. It’s a quick fix and we never have leftovers. For Christmas this year, I have a seven-layer salad on my menu. The ingredients are just like the name calls for: seven main ingredients plus a few you most likely already have on the shelf. Bacon, iceberg lettuce, red onion, shredded Cheddar cheese, frozen green peas. chopped cauliflower, and mayonnaise are the big show for this dish. The first six ingredients are layered in a glass or plastic (see-through) dish. The dressing is whipped up from Miracle Whip and a bit of sugar. 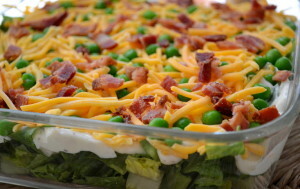 Visit the Road Mom’s recipe box for the exact seven-layer salad recipe. 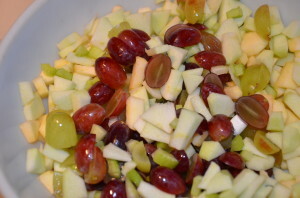 Apple salad is a traditional dish on our holiday menus. My Grammy has been making apple salad for longer than I can remember. She got the recipe from my Great-Grandma. I can remember my Great-Gram peeling an entire apple around and around with a silver paring knife so the peel was in one piece when finished. 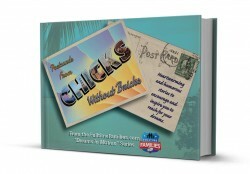 Memories!!! The ingredients for this delectable dish are simple: 4-5 apples, grapes, celery, mayonnaise, marshmallows, powdered sugar, nuts, and Cool Whip. My Gram always told me to dice the apples first and coat them with a few dollops of mayo to keep them from browning. Adding the rest of the ingredients are a snap and does well in the refrigerator for several hours prior to the meal. The instructions for my Gram’s apple salad are filed in the recipe box. Pretzel salad is a family favorite in our rig. It’s a sweet and salty fare and the red in this dessert-ish salad is perfect for Christmas. 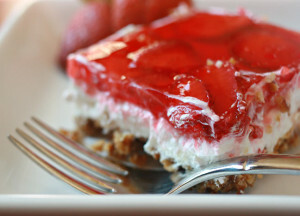 The items in the recipe are easily gathered: crushed pretzels, sugar, butter, cream cheese, Cool Whip, strawberry Jello, frozen strawberries, and boiling water. About 20 minutes of prep time and this festive dish goes in the refrigerator for a fast and tasty treat. Check out the recipe box for the exact instructions for preparing this yummy three-layer pretzel salad. Preparing one or two of the salads above, even partially, the night before will help coordinate the holiday feast in a flash. The dishes hold up well after the meal to fill in for leftovers in the days following this family holiday. Stay tuned for Part 3 of Planning Your Holiday Dinner in the RV tomorrow as we look in my Gram’s recipe box for our favorite side dishes.